When I learned that Alex Gregory would speak at the Terry Third Thursday breakfast–sponsored monthly by the Terry College of Business at the University of Georgia–I knew I would attend. Alex and I became acquainted when I was vice president of Georgia College. Alex was an alumnus of the college, and a fast-rising corporate leader with YKK in nearby Macon, Georgia. 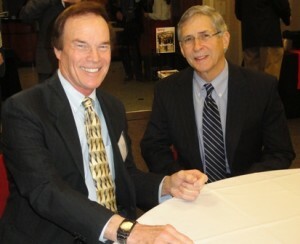 On several occasions a couple of decades ago, I heard Alex make presentations, both at his headquarters and on campus. Even then, he demonstrated powerful communication skills. While he spoke at breakfast this morning, he held the audience spellbound. After the program, I told him he would make a grand role model for my Speech Coaching clients. Not surprisingly, he has reached the top level in business, serving now as President/CEO and Chairman of the Board of YKK Corporation of America. Addressing the impression that YKK manufactures only zippers, Gregory described a vast variety of other products, including vinyl windows, curtain rods, bumpers for automobiles, and inflatable collars for pilots. Besides mastering the art of speaking to a group, Alex Gregory interacted with the audience masterfully during informal conversations before and after his program. I was delighted to be among those he gave full attention to individually. Several of the university’s outstanding business students attended. My prediction: Alex Gregory energized them to pursue courses and coaching to elevate their speaking skill, having seen the gripping communication competence of a top executive. Yes, Alex was indeed that impressive. Alex and I will welcome your comments. Go to the end of the blog entry in the section below and click NO COMMENTS if none have been made, or if comments have been made click 1 comment, 2 comments, or whatever the comments button says. The comments section will appear.